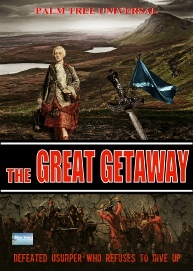 Charles Edward Stuart, grandson of deposed James II, faces crushing defeat in the Scottish Highlands and flees to the Isles. Passed on from supporter to supporter he spends a month hiding with his Irish commanders as the British troops scour the land. A reward of £30,000 is posted for his capture, a sum that fires the imagination of all Europe. When his Irish companions abandon him and escape by ship, Charles dresses up as a serving girl is smuggled by Flora MacDonald back to the mainland where he is re-united with some of his loyal Scottish commanders. Evading capture time and time again as his supporters one by one fall into the hands of the troops, Charles, at first seen as a weak and forlorn figure, turns into a man of character and fortitude who revives the Highlanders sense of worth and dignity in the face of the hangings and transportation's enacted by the British troops in the aftermath of his defeat. Everyone has lost a loved one, but none blame Charles for their loss as his survival is their only hope that all their grief and suffering has been to some avail. After five months of hardship and constant danger, a French ship arrives off the coast and takes him away forever. Hailed in Versailles by Louis XIV as a great hero, Charles is left to reflect that he found the greatest loyalty and the finest moments in his life, not at the head of his army, but in his time amongst ordinary people who risked and lost their lives for him.